We agree with Ghandi. And, aggregating those individuals toward common and integrated goals is anything but easy. Enterprise level change is hard and complex. The success rate of implementing change to achieve business objectives is dismal. For years Professor Kotter, based on his research, has been talking about the accelerating pace of change and a 70% failure rate of change in business 1. The following independently support that range of implementation failure. According to Boston Consulting Group, 85% of companies have undertaken a transformation during the last decade; That same research found nearly 75% of those transformations fail to improve business performance 2. Why aren’t the historic and current solutions for change, while widely used, effective 5? Because they are too narrowly focused. Successfully implementing change happens by changing individual behaviors. Aligned processes and systems are critical, but most any practitioner and many researchers will tell you leadership support is the most important success factor for change- bar none 6. So, is Organizational Change Management’s top-down view the answer? No. It it is too highly focused on leadership alignment, again necessary but not sufficient, and misses the detailed managerial-driven change necessary for the individual. Individual change management, while necessary and effective for individuals, only provides support and reinforcement from the bottom-up. Enterprise change requires the rigor of detailed task management and integration found in Project and Program Management, but again while defining the “how” in detail through EPMOs 7, is also insufficient as a stand-alone solution. What is required to implement change in most of our businesses is an integrating approach considering Individual Change Management, Organizational Change Management, Project and Program Management, and more- all pulled together and aligned through a set of guiding principles. There are commonalities to successful implementation. Be it post-M&A integration, digital transformation or continuous improvement, it all boils down to getting the organization and individuals within the organization to do things differently. And, we must accomplish this multi-faceted effort of leading and managing change to provide a catalyst both for the organization and for the individual to achieve targeted results. The representative methodologies for each of these four component’s at least touch on the others through a number of complementary, and sometimes competing, frameworks, tools and methodologies. For the sake of brevity, we will begin with a few widely referenced mental models for change, but we will remain focused on the role of each of these components (i.e., Individual Change Management, Organizational Change Management, Project-Program Management, and Guiding Principles). As a practitioner and student of leading and managing both organizational and individual change for more than 25 years, including 6 years with a boutique consultancy focused on and named for large-scaled strategic change, C-Change, I have yet to find a framework, or an approach, which doesn’t have its foundation in The Change Formula. consultant in the 1960’s, David Gleicher. As I was researching change in the 1990’s I found a number of references to The Change Formula, but at that time I was unable to find attribution to a very simple framework I have used as a basis of describing and driving change and key messages of communication for more than 20 years. Vision of the Future represents a positive picture of what is possible in the future. I recently discovered a management consultancy advocating for the “vision” to be a compelling and emotional story, similar to current thinking in brand marketing. Steps to Achieve the Vision represents realistic actions and activities to reach the vision; requires both resources and approach. 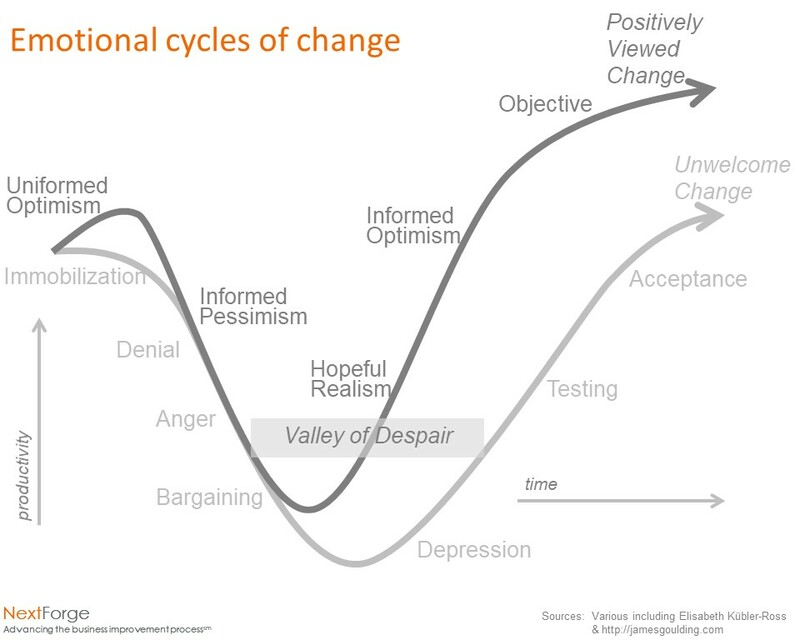 Many initiatives fall into the “Valley of Despair” only to lose traction and fail 14. We would suggest the high failure rate is at least in part due to not understanding or managing through these emotional stages of change. When we think of what the individual is going through, we should also consider the “how” and “who” is most appropriate to work with an individual. Let’s conclude our quick flyby of a few common foundational concepts, and get into our key components of change management by first introducing Individual Change Management through Prosci’s ADKAR®. Putting a tactical lens on change- Prosci’s ADKAR® focuses on change management from the bottom-up: the individual. ADKAR® is an acronym for a series of sequential steps individuals must go through to change: Awareness | Desire | Knowledge | Ability | Reinforcement (ADKAR®). And, while ADKAR® posits its ability to address top-down, Organizational Change Management, ADKAR’s Change Model is founded on two basic ideas 17. Prosci follows a series of gates and sequential phases of change as represented from left to right in the following graphic 18. Prosci refers to the integration of project and change management across leadership and sponsorship as the Project Change Triangle. This is very similar to Project Management Institute’s project management “iron triangle,” noting Prosci’s addition of leadership and sponsorship roles 19. 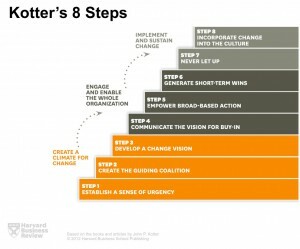 Putting a strategic lens on change- Kotter’s focus on change leadership from the top-down- the affected organization. Kotter separates the actions of leadership from those of management. 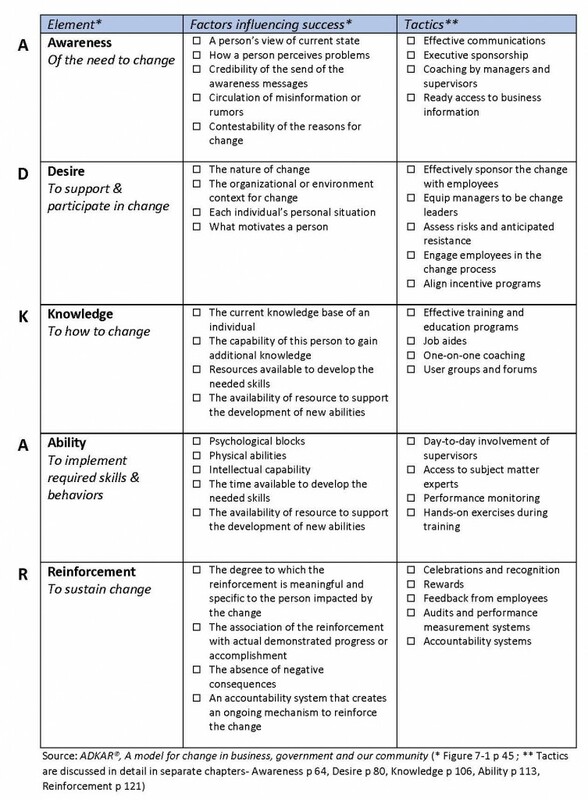 Summarily laid out in the following table, the focus of leadership defines direction and is the engine for the change process, where management’s focus is on tools to keep change controlled. Kotter has been advocating for the management-driven hierarchy focused on reliability and efficiency to co-exist with the strategy-accelerating network focused on agility and speed 21. The traditional, box-and-wire structure continues to serve as the central organizing principle for the enterprise. The idea of the “dual operating system” is to efficiently add cognitive capacity to existing teams, while integrating hierarchical management structures with significantly faster horizontal, cross-silo networks. The eight accelerators are processes that enable the strategy network to function. Earlier versions of Kotter’s thinking suggested a gated sequencing, which in subsequent versions were reconsidered to be concurrently at work throughout organizational change 25. Never let up. Keep learning from experience. Don’t declare victory too soon. Each of Kotter’s steps and/or accelerators must be led and managed with focus on the individual, and each step’s execution, as with ADKAR®, must be resourced, planned, integrated for the appropriate stakeholder. In the following graphic, we have considered the key elements from both the Organizational Change Management framework by Kotter (left side of following figure) and the Individual Change Management framework by Prosci (right side of following figure). The Harvey balls represent significant support of the approach workstreams for various change management elements. Support activity for individual and organizational change are best if structured and integrated through common tools and principles. Source: NextForge comparative analysis of the ADKAR® Framework (see summary above) and A Guide to Project Management Body of Knowledge (PMBOK® Guide) 5th edition. Depending on a number of factors specific to a given project 28, we nimbly apply enough of the appropriate project management structure, informed by guiding principles, to ensure success and avoid the risk of failure. A continuum of project management support is available to us from simple, un-chartered project management to formal Executive PMO and multi-project program management. Project Management: In simplest terms, is the constant management of tradeoffs between scope, schedule and costs 29. Project Management Institute describes project management in terms of the iron triangle or the triple constraints 30. 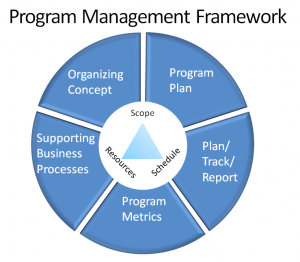 Program Management: wraps and supports the project management efforts on multiple projects with supporting structure including: Organizing concept, program plan, plan/track/report (scope, schedule and resources), program metrics, and supporting business processes 31. Because of increasing uncertainty in the business environment, the need for organizational flexibility continues to increase, and many companies are turning to agile concepts particularly for project planning and execution. We have been successfully utilizing agile concepts and progressive elaboration in our engagement approach design for more than 10 years. As a very quick summary of how agile principles can be applied to nimble business-oriented teams, here is an excerpt from our Point-of-View post on agile (scrum) concepts what we have called Swift-Teamssm . As an engine for driving process and behavioral change into the organization, Swift-Teams provide short-interval deliverables, typically within three to four weeks. Each team’s work is sequenced with other on-going initiatives, and is managed via an integrated plan that lays out the scope and sequence of work/team modules. In order to manage the overlap in the ADKAR® Model for Individual Change Management and the Accelerators for Organizational Change Management, while there are a number of ways to define guiding principles for change management, we recommend a technique we have used for more than 20 years- The Concept of One 33. We find guiding principles focused on integration critical to early alignment of expectations and activity. Guiding principles, ensure the design and execution work is planned and scheduled in right priority and sequenced with the right level of change-resistance mitigation resourcing fully supported by leadership, management and employee. By focusing on a single overall “approach map” we can “hardwire” key change concepts into the workstreams and steps of the approach including graphically visible relationships between critically interdependent activity. We have included an approach map template below for illustration of the key moving parts (business objectives through to workstream deliverables) and general layout. The “one approach map” acts as a master plan including a roadmap, allowing work-stream project leads to utilize their own, or conform to PMO standard, project management tools. Alternately, if the complexity and risk is great enough, we can build an integrated project/program management plan inside a tool, like MS Project or Primavera, for critical-path analysis and enterprise-wide resource management. 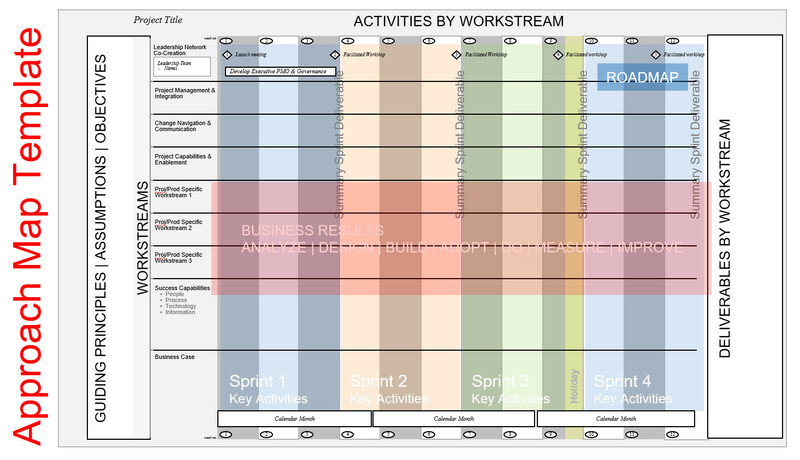 Our one approach map is a tool to integrate up to 100 key activities organized by workstream and informed by guiding principles to provide a comprehensive frame for detailed planning for executives (top-down) and managers (bottom-up) focused on overall objectives and workstream deliverables. Critically, outcomes are tied to specific actions; not only do we ensure expectation will be met if the work is done, but we also inform team members how their work contributes to the end results. Integrating these key components for affect will increase the success rate for your transformation, your M&A post-acquisition integration, and your digital transformation by changing individual employees one at a time in synch with the necessary speed of organizational change. For more information on Gallup’s Q12, see Wagner and Harter, 12 The elements of Great Managing, NY, NY: Gallup Press (2006). At the time of the printing of this New York Times best seller, responses and meta-data on business performance were based on more than 10MM employee surveys. See Kotter’s, Accelerate: building strategic agility for a faster moving world, Harvard Business Review Press, Boston, MA (2014), p 37 and the typical lifecycle from network to hierarchy p 70. Also consider the parallel concept based on recent research by Christensen, “The Hard Truth About Business Model Innovation,” MIT Sloan Management Review, Fall 2016, where Christensen, et al’s research demonstrates new business model’s necessary separation from the sponsoring organization, progressing along an arc from new market formation (creation), to process formation in response to recurrent tasks (sustaining innovation), to modular structure formation, and finally to investors’ demand return of capital (efficiency). Sourced from an unpublished working paper Everson and Reeder, “Enhanced Enterprise Execution, Catalyzed by a Dynamic Social Network,” Adjuvi, April 2017. See overview discussion of Kotter on leadership and change in Reeder, “Change Leadership ll, Understanding Kotter,” NextForge, [internet] [cited July 28, 2018] Available from http://nextforge.com/?p=1587; Kotter’s 8 Step Graphic is from “Accelerating Change based on the work of John P. Kotter,” Harvard Business Review, [ebook] [purchased 2012] 9467TL-PPT-ENG.Microsoft PowerPoint, 82 pages. Join in on the conversation. Let us know what you think!